Did Your Duplex Start As A Kit? | Your best resource for buying, selling, owning and investing in duplexes and duplex homes. Have you ever noticed that a lot of Minneapolis and St Paul duplexes look a lot alike? Drive down Grand Avenue; either in Minneapolis or St Paul and you’ll see them; up/down duplexes with a living room, archway to dining room with a built-in buffet, two bedrooms, with a bathroom in the middle, average to mid-sized kitchen and sometimes, a third bedroom in the back. In fact, many single family homes or bungalows often have the same floorplan, sans the second story, of course. The Longfellow neighborhood is packed with them. So too are the Town and Country and Como neighborhoods in St Paul. So was there one builder with a single good idea? Why not leaf through a catalogue and simply order a duplex? Or a house? In the early 20th century, companies like Sears and Montgomery Ward’s published catalogs of not only house plans, but all the materials that went with them as well. Light fixtures could be ordered from the catalog. Boilers. And the latest rage; indoor plumbing. For somewhere around $2500-$3500, Minnesotans could order the house or duplex of their dreams by mail. And some time later, they simply went down to the train station and picked it up. All they had to do was put all the pieces the company sent together. While I’ve been aware of the history of kit houses for some time, I only recently learned that duplexes, or, as they were called in the early 1900s, double bungalows, could be purchased this way as well. My curiousity piqued, I tried to track down everything I could about the history of kit double bungalows. All roads lead to Rosemary Thornton. Widely regarded as the nation’s leading expert on kit houses, Thornton has lectured at the Smithsonian, had her work featured in the Wall Street Journal, New York Times, Washington Post and Los Angeles Times, appeared on PBS’ History Detectives, A&E’s Biography, and the CBS Sunday Morning News. 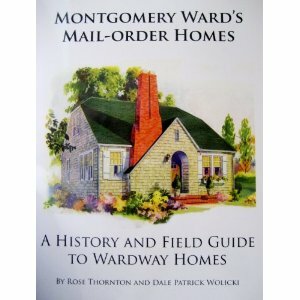 Her books include: The Houses That Sears Built, Finding The Houses That Sears Built, Montgomery Wards Mail-Order Homes and The Ugly Woman’s Guide To Internet Dating. Clearly, this is a topic that is much bigger than I’m capable of understanding and blogging about. So, next week, for the first time ever, there will be a guest blogger on Duplex Chick, when Rosemary Thornton stops by to talk about the history of kit duplexes.